J&J Fence is dedicated to offering the local area with high quality fence construction at the best prices in Beverly Hills. We build superior fences and gates for homes and businesses, and are also well known for our gorgeous window bars and handrails for balconies and stairways. In order to meet the diverse needs of our customers throughout Beverly Hills, such as restaurant owners, homeowners, property managers and general contractors, we have become specialists in custom fence fabrications and installations. All of our fences, window bars and handrails can be as ornate or as simple as you want them to be. We have thousands of designs and pictures to inspire you, and can even work from a basic sketch. There is a wide range of toppers, caps, decorative touches (scrolls, stars, medallions, etc. ), and gate access control and operator systems you can add to nearly anything we make. We can even combine materials to create sturdier fences or a semi-private fence (a cinder block wall or wood fence with iron spears or pickets creates a timeless and elegant look). Call today for a free on-site consultation and price estimate in Beverly Hills. Everyone on our team is a masterful fence craftsman, averaging 15 years of experience each. We would be happy to help you plan your project, select your materials and finalize your design so that you ultimately get a fence that is customized to your individual requirements and preferences. 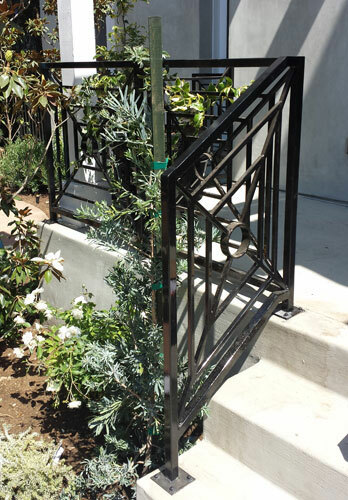 In our 30-plus years of service to the Beverly Hills area, we have earned our spot as a reputable and reliable fence contractor that residents can count on for high quality iron, steel, aluminum, vinyl, wood and cinder block fences and gates at great rates. Call today and take advantage of our free consultation and price quotes. There is no obligation, so you can take the time you need to consider your options and obtain a few more price quotes. We trust that you will return to J&J Fence because from our service to our rates to our knowledge and professionalism, we offer the best value in Beverly Hills when it comes to fencing. Our fencing installation services are just as high quality as our fence fabrications. 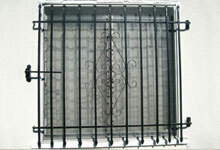 We can install fences, railing, window bars/grills and gates to fit any space and landscape. 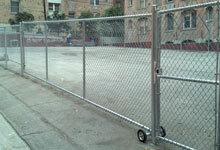 From our chain link fences to roll up doors, we know how to erect a fence to last. Additionally, we have our own electrician to help with final touches such as installing gate operators or access control systems. If you are reading this, then it is likely time to repair or upgrade the look of your fence. The fence professionals at J&J Fence offer residents of Beverly Hills their expertise in steel, iron, aluminum, wood, vinyl and chain link fences and gates in order to allow them to upgrade, fix, or replace their existing fence at a reasonable price. Call us today to discuss the possibilities. Price quotes are free. 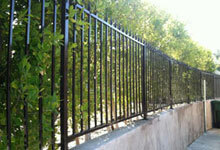 Your Beverly Hills, CA Fencing Project Deserves the Expertise of J&J Fence, Call Today! 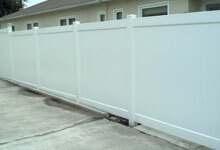 J&J Fence is a family-owned and -operated business that is fully licensed, bonded and insured. We never use subcontractors. We are able to maintain our high quality by having ownership supervise every aspect of every project. We want your job to be done right the first time and aren't happy until you are. Look at our gallery for samples of our work and call today to learn more about our long lasting, high quality work and competitive pricing. New customers enjoy a 10% discount.